ChinaDIY got hold of the Galaxy GeForce GTX 780 HOF and provides a brief overview of Galaxy’s flagship GeForce 700 series offering. The GeForce GTX 780 HOF follows six principles - frequency, power, materials, PCB, cooling and overclocking. All these principles combine to form Galaxy’s highest tier Hall of Fame edition GPU offerings. In terms of specifications, the GeForce GTX 780 HOF comes with the GK110-300-A2 core that features 2304 cores, 192 TMUs, 48 ROPs and a 3 GB GDDR5 memory running along a 384-bit interface. The card makes use of custom designed PCB which is white in color and features memory chips from Elpida Memory. The core runs at an clock speed of 1006 MHz with a GPU Boost clock of 1058 MHz while the memory operates at the reference 6008 MHz or 6 GHz effective frequency. The PCB design on the GeForce GTX 780 HOF is impressive in itself, featuring an 8+2 Phase PWM which is given power through dual 8-Pin connectors. The back of the PCB is equipped with the industry’s high-end Panasonic tantalum capacitors. In total, the core has its eight while the memory has four KEMET tantalum capacitors with a capacity of 330uF. On the back, six MDU3606 Mosfet from Magnachip can also be spotted. To deliver high-speed under overclocked specs, the memory is equipped with its own heatspreader. The PWM supply has its own set of heatsink. Its an incredible design for a PCB which would allow users to gain impressive overclock settings as seen previously when HKEPC overclocked the same GPU to 1900 MHz on core and 7.4 GHz memory clock as seen here. Ofcourse, a GPU of such a design would require large amounts of cooling to keep the core and memory stable. Galaxy covers the cooling side with their flagship HOF series dual fan cooler which offers a much beefier heatsink design. The Galaxy GeForce GTX 780 HOF makes use of a densely packed aluminum fin array that’s conveyed heat through four 6mm heatpipes running through the copper base. The dual fans measure 9cm and have a total of 9 blades which are enough to handle some mighty overclocks. The shroud itself looks beast for the monster card that is the GeForce GTX 780 HOF. A separate external power supply module also ships with the GeForce GTX 780 HOF which can be bought offering an 8 Phase PWM with its own set of voltage adjustment and tuning points powered via three 8 Pin connectors. A must have for LN2 overclocking. As far as pricing is concerned, we don’t have any concrete details yet but it looks like the card would be limited to the APAC region for now just like the iGame Kudan GTX 780 models. 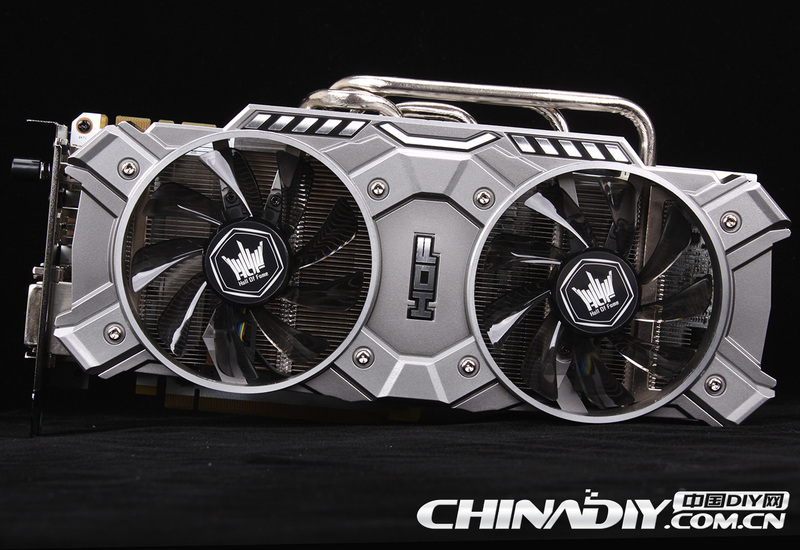 Nevertheless, NVIDIA’s AIC partners did pop up some real cool looking GeForce GTX 780 models this round such as the GTX 780 DirectCU II OC from ASUS, MSI’s upcoming GTX 780 Lightning, Gigabyte’s WindForce GTX 780 and not to mention, the EVGA GTX 780 Classified with ACX cooler. This card looks pretty BADASS!! I really like the white PCB.. this would really go nice with a white build. Dang. When is that coming out and for how much? Last edited by nfs3freak; 26-07-2013 at 00:07. The White PCB is sweet!! Go HOF GTX! I can't wait to see one in person! We should have the Gigabyte GTX780 OC review published very soon, then the MSI GTX 780 OC Review. In a week or two, we should have a new GPU from MSI, but that's all I can say for now. HOT white pcb HOF! look at those phase power and heavy pipes, COOL! MSI GTX 780 thunder / lighting / GPOWER series?